The French winger was booed by the home supporters inside the Imtech Arena every time he touched the ball and scored himself via a deflection in the 55th minute to seal victory for the defending champions. 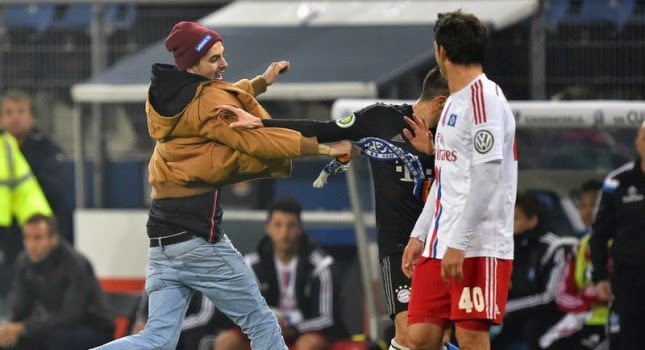 The incident occurred in stoppage time when a spectator ran the width of the field and hit Ribery in the face with a scarf before taunting the Bayern star. The man was subsequently accosted and escorted out of the stadium. Robert Lewandowski had opened the scoring for the Bavarians after just seven minutes and David Alaba doubled their advantage just moments before half-time, with Ribery wrapping up the content early in the second half, although Pierre-Michel Lasogga pulled one back for the hosts with five minutes remaining.